Double vinyl LP pressing. Original soundtrack to the 2018 motion picture starring Bradley Cooper and Lady Gaga. Gaga and Cooper collaborated on the soundtrack album with an assortment of country musicians, including Lukas Nelson, who also stars in the film as a member of Cooper's band. For the more pop-oriented songs on the soundtrack, Gaga teamed up with recurring collaborator DJ White Shadow. The soundtrack also includes contributions from Jason Isbell, Mark Ronson, Diane Warren, and Andrew Wyatt of Miike Snow. A Star Is Born was produced and directed by Bradley Cooper, in his directorial debut. Cooper also wrote the screenplay with Will Fetters and Eric Roth. A remake of the 1937 film of the same name, it stars Cooper, Lady Gaga, Andrew Dice Clay, Dave Chappelle, and Sam Elliott, and follows a hard-drinking country musician (Cooper) who discovers and falls in love with a young singer (Gaga). Stefani Joanne Angelina Germanotta, born March 28, 1986, better known by her stage name Lady Gaga, is an American singer, songwriter, and actress. She initially performed in theater, appearing in high school plays and studied at CAP21 through New York University's Tisch School of the Arts before dropping out to pursue a musical career. 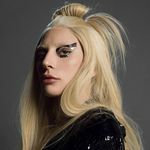 After leaving a rock band, participating in the Lower East Side's avant garde performance art circuit, and being dropped from a contract with Def Jam Recordings, Gaga worked as a songwriter for Sony/ATV Music Publishing. There, Akon noticed her vocal abilities and helped her sign a joint deal with Interscope Records and his own KonLive Distribution. Gaga rose to prominence with her debut album The Fame (2008), a critical and commercial success which produced global chart-topping singles such as "Just Dance" and "Poker Face". A follow-up EP, The Fame Monster (2009), was met with similar reception and released the successful singles "Bad Romance", "Telephone", and "Alejandro". Her second full-length album Born This Way was released in 2011, topping the charts in more than 20 countries, including the United States, where it sold over one million copies in its first week. The album produced number one single "Born This Way". Her third album Artpop, released in 2013, topped the U.S. charts and included the successful singles "Applause" and "Do What U Want". In 2014, Gaga released a collaborative jazz album with Tony Bennett titled Cheek to Cheek, which debuted at number one in the United States and became her third consecutive number one album in the country. Gaga is noted for her flamboyant and diverse contributions to the music industry via her fashion, live performances, and music videos. With global album and single sales of 27 million and 125 million, respectively, as of June 2014, she is one of the best-selling musicians of all time. Her achievements include five Grammy Awards, 13 MTV Video Music Awards, and 11 Guinness World Records. She regularly appears on Billboard's Artists of the Year lists and Forbes' power and earnings rankings, and was named one of the world's most influential people by Time in 2010. Outside of her music, she is noted for her philanthropic endeavors and activism for LGBT rights. American actor, filmmaker and singer, born January 5, 1975 in Philadelphia, Pennsylvania, USA.